A tale of three parish appendages which became one Community area, and four landed estates reduced to one. Dominated by the 4R’s (Road – Rail – River – Rocks), its development largely became the domain of 4 families until the middle of the 20th Century: then a surge of building from 1970 onwards, trebled its size. From the traditional crafts of carpenters, blacksmiths, iron smelters, charcoal burners, shoemakers, clogmakers, tailors, seamstresses, spinners, weavers, quarry men and farmers; all, but the latter, had disappeared by the Millennium; replaced by a largely commuting and retired class of people; and sprinkled with the interesting variations of an antiques dealer, a race-horse trainer, a canoe specialist, an airline pilot and a rally driver. 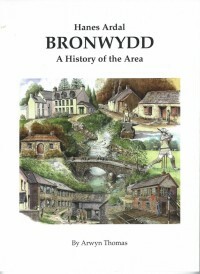 From an almost monoglot Welsh community at the end of the Nineteenth century, Welsh culture remained strong for three quarters of the Twentieth century, before losing ground in the last quarter.